Add the deep brown tones of the Wells Bubble Vase Russet to your home. With its petite proportions it’s ideal to pop in a vacant window sill, alcove, shelf or bedside table. The vintage bottle colouring looks striking in rustic interiors, matching natural wood with recycled glass. 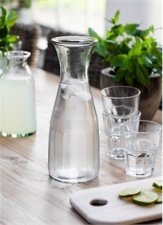 Expertly hand blown in 100% Recycled Glass, the organic shaping gives a unique alternative to traditional shaped vases. The Wells Bubble Vase is designed for use with one or two stems keeping the display simple and elegant.